Thyroid disorders occur when there is some problem with the functioning of thyroid gland. It is a butterfly-shaped gland that lies in front of the neck. Thyroid gland plays an important role in regulating metabolic processes. . Different thyroid disorders affect the structure and functioning of the thyroid gland. The most important hormone produced by this gland is Thyroxine (T4). It is converted to triiodothyroxine (T3) which acts as the most active hormone. Pituitary gland regulates the release of thyroid hormones. 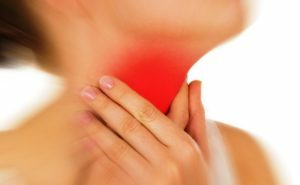 Hyperthyroidism is a thyroid disorder that occurs when the thyroid gland becomes overactive. The thyroid gland starts producing more amounts of thyroid hormones that circulates in the blood. More amount of thyroid hormones in the blood affect the metabolism of the body. It increases metabolic rate and there is increase in the heart rate, blood pressure and can cause tremors in the body. There is loss of weight and frequent bowel movements. A person may feel nervous and irritable. There is irritability and cannot concentrate properly. Heart rate increases and there is irregular heart beat. Divya Kanchanara Guggulu: This is one of the most important herbal remedy used for the natural treatment of hyperthyroidism. It is an effective remedy to control the growth of unwanted cells in the body. It also helps in reducing inflammation. It is a wonderful remedy to prevent growth of cancer and tumors in the body. It helps in controlling the metabolic rate and appetite in a natural way. It also helps to maintain ideal body weight. It also helps to improve skin tone. It is an excellent herbal solution for all types of digestive problems. It helps in clearing bowel movements and prevents constipation. It also boosts up energy and help to live optimum life. Bark from Kanchanara: It is the main ingredient of this remedy that helps in balancing the thyroid hormones. Triphala: It helps in regulating the digestive disorders. It reduces appetite and also helps in proper metabolism. Trikatu: It is also an energy boosting herb and helps in regulating the functions of the digestive system. Bark from Varun: This helps in balancing the thyroid hormones. It stimulates the normal functioning of the thyroid gland. 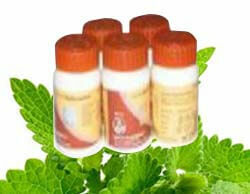 Elachi: It helps to get rid of thyroid disorders naturally. It helps in proper digestion and metabolism of the food. It also increases body immunity. Dal Chini: This herb has anti-inflammatory properties and it helps in reducing inflammation in the body. It also prevents growth of tumor cells in the body. Tej patra: This is an excellent herb for boosting up the immune system. It also regulates the functioning of the digestive system. Shudh Guggulu: This is also an important herb to regulate the functioning of the thyroid gland. Aerand ka Taila: It helps in balancing the hormones and also boosts up the immune system. All the ingredients of this herbal remedy are safe and natural. The ingredients work with each other to produce effective and quick results. It stimulates the functioning of the thyroid gland and helps to manage proper digestion and body weight. It also helps in regulating body metabolism. It is recommended to take two- four tablets, two times in a day after meals with water. Flaxseeds help to control the secretion of thyroid hormones naturally. It is a wonderful home remedy for hyperthyroidism. It is a rich source of omega 3 fatty acids. Take one teaspoon of flaxseeds and soak in half cup of water. Drink this water in the morning and eat flaxseeds to balance the thyroid hormones. Ginger is also a wonderful home remedy to balance the thyroid hormones. Ginger is an excellent source of natural minerals. It is also known for anti-inflammatory properties. It helps to treat thyroid disorders naturally at home. People with hyperthyroidism can drink ginger tea regularly to balance the hormones. Coconut oil is another useful remedy for getting rid of thyroid disorders. It may be used for cooking to control the secretion of thyroid hormones. You can also add one teaspoon of coconut oil in a bowl of soup or add two teaspoons in a glass of hot milk and drink it daily to get rid of thyroid disorders. People suffering from thyroid disorders should expose to the sun for at least 15 minutes or more to get vitamin D. it helps in the proper metabolism of calcium in the body and also helps to balance the thyroid hormones. Yoga and exercise also helps in the normal functioning of the thyroid gland. One should do regular exercise and should perform yoga asana to balance the thyroid hormones and for getting rid of thyroid disorders. Exercise helps to enhance the body strength and also helps in proper digestion and metabolism of the food. One should eat iodine rich food to regulate the functioning of thyroid gland.